Sometimes it’s helpful to have a standby breakfast that you don’t have to think about too much. It should be an appetizing, filling, and nourishing day-starter. This menu has it all, and you can put it together in a jiffy for yourself or a houseful: sauteed chorizo with peppers (and greens, if you like), oven-baked eggs, fruit with coconut butter drizzle, and, of course, coffee. Spicy chorizo has just the right amount of heat when sauteed with sweet peppers, the eggs are great in combination with the sausage and peppers, and coconut butter adds richness to just about any type of fruit. (8) plate food, pour coffee, and enjoy. For the baked eggs, preheat oven to 350°F. Spray a little oil into ramekins, or if serving a crowd, into a muffin tin. Break one egg into each ramekin or muffin cup. If using ramekins, place on a small baking sheet to make them easy to remove from the oven. Bake 10 to 12 minutes or until whites are set and yolks are thickened (longer if you like harder eggs). Sprinkle with salt and pepper. Run a table knife around each cup and slide egg onto plate. For the fruit, such as peaches, berries, cherries, banana, or melon, slice or cut into chunks, and add a drizzle of coconut butter (also called coconut manna or coconut cream concentrate). Place a skillet over medium heat. Add diced chorizo or sausage. Saute 5 to 10 minutes or until browned, stirring occasionally. Add bell pepper and onion to skillet and, if the chorizo is lean and the mixture seems dry, a little oil or fat. Saute 5 to 10 minutes or until soft. Turn off heat and serve, or, if desired, stir in greens until just wilted, and serve. Everyone is talking about eating “Paleo.” What does it mean? And what are the benefits? Eileen Beran sheds light on the subject and shares her recipes every month with our readers. Paleo is an eating style that excludes grains, legumes, starches, dairy and refined sugar, but includes meat, fish, poultry, eggs, nuts, good fats, fruit, and various fresh vegetables. Avoid refined foods; only foods that can be hunted or gathered. A few reported benefits: Improved health, Increased energy, and Weight maintenance. 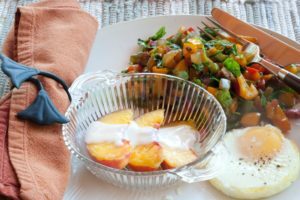 Sauteed chorizo with peppers and greens, oven-baked egg, and peaches with coconut butter. Chorizo, sausages, in paleo world they are acceptable. They do, however, carry an excessive amount of fat, as you can see by the amount of calories in this marvelous breakfast. So this would not be a meal that you eat everyday, but it is a perfectly beautiful and healthy breakfast if served once or twice a month, as the writer states, for yourself or for a group. If you don’t eat pork, then here are some alternate choices: Organic Andouille Sausage by Applegate or Organic Italian Chicken Sausage by Organic Prairie (these are costly). If you would like to eat pork, then I recommend that you use Beeler’s pork. It is the best and purest pork meat found in the United States. This small farm in Iowa has been raising hogs since 1846 using a proprietary method called Haluka, which in native American means “raised under the sun.” These hogs are never fed growth hormones or chemically treated in any way. They have free access to spacious bedding areas, food, water, and a “stress-free socialization” after they are weaned from their mother. Their bratwurst, weiners and bacon are completely natural, containing sometimes only hickory flavor. No nitrates nor any other chemicals are added. The sausages must be ordered directly from them: sandiw@beelerspurepork.com. The bacon can be found on other websites or at the chain store “fresh & easy” under fresh & easy’s generic brand, but it is mixed with other bacons, so you have to read the label. I’m extremely pleased to find this page. I wanted to thank you for your time just for this wonderful read!! I for all time emailed this website post page to all my associates, since if like to read it next my friends will too. I was very happy to find this site. I wanted to thank you for your time for this particularly fantastic read!! it smart. I cant wait to learn far more from you. That is actually a terrific web site.